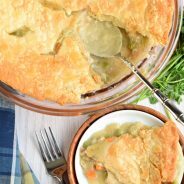 Looking for a fun dinner idea? 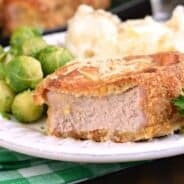 Or the perfect Game Day meal? This Italian Beef Ring is hearty and delicious! So a few weeks ago I shared a recipe for Slow Cooker Italian Beef. Remember? I talked about my love of all Chicago food. 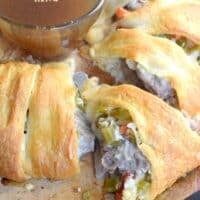 Today’s Italian Beef Ring recipe is just an extension of that love of my favorite foods. 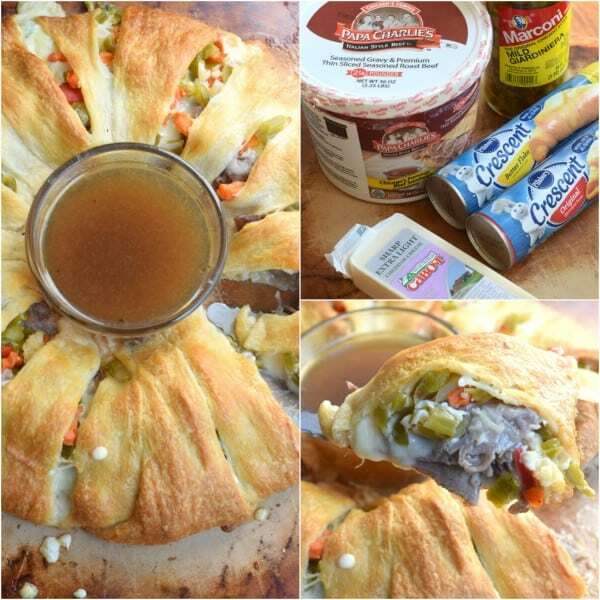 Making crescent roll rings and braids is such a quick dinner fix idea. And if you make my homemade Italian Beef recipe, you may find yourself with some leftovers. And if your family is like mine, the “L” word gets groans from my troops. I understand it. I don’t usually enjoy leftovers either. However, taking our leftovers and making a new dinner out of them is key to eliminating food waste, and getting cheers from the family. This weekend, I’m spending some time in Chicago with some of my favorite bloggers! Be sure to follow me on Instagram to see some behind the scenes of my trip. Otherwise known as, “pizza places we will be eating at.” Haha!! Once you’ve added your layer of beef, add some cheese (I love using Cabot Seriously Sharp Cheddar). Also add some giardiniera into the ring (drain it first). If you can’t find it in your stores, I’ve got a homemade giardiniera recipe on the blog. Just chop up the veggies a little more fine! 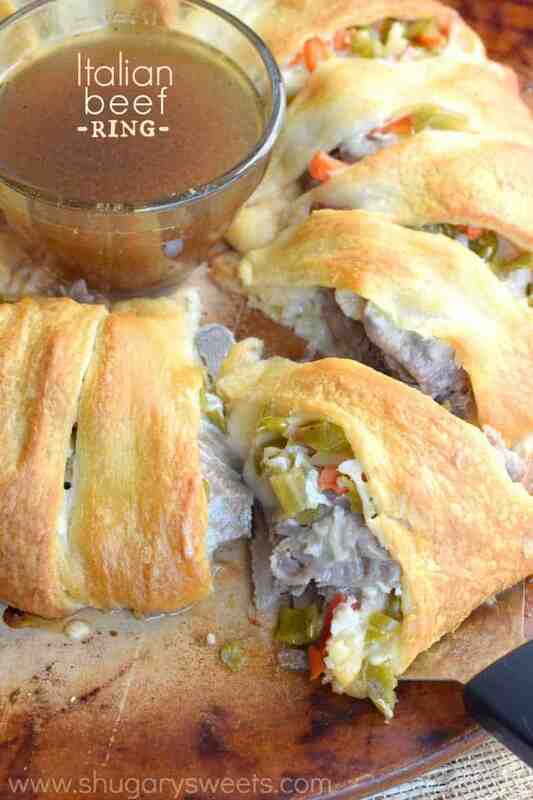 Serve your Italian Beef Ring with au jus and enjoy!!! 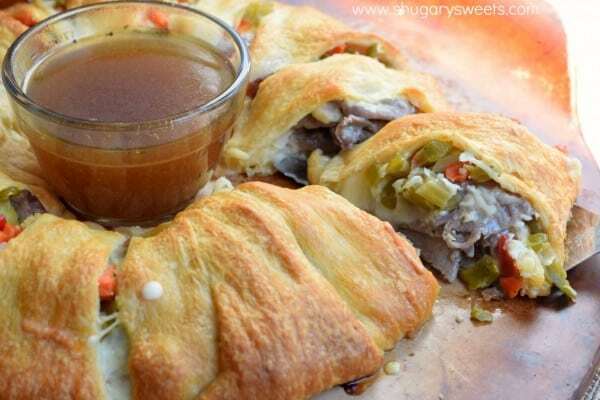 Game day Italian Beef Ring with au jus! Using a large pizza pan, open packages of crescent rolls. Lay the first package in a large circle, connecting the wide part of the crescent roll in the center. Top with second package of crescents. 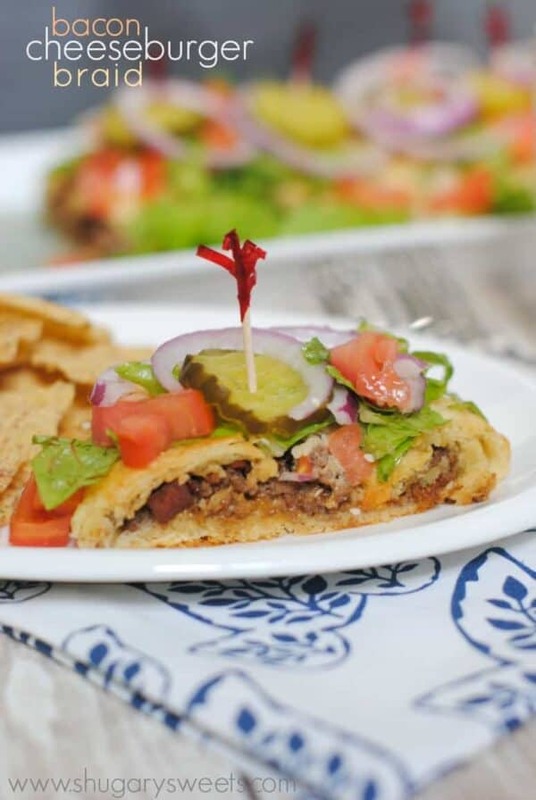 Use fingertips to combine and create an indentation to add italian beef. Fill indentation with Italian Beef. Top with giardiniera and shredded cheese. Roll triangles up over filling, using hands to spread dough as needed. Bake in a 375 degree oven for 25-30 minutes. While baking, heat au jus. If using my homemade slow cooker recipe, use the excess juice in the crock pot. 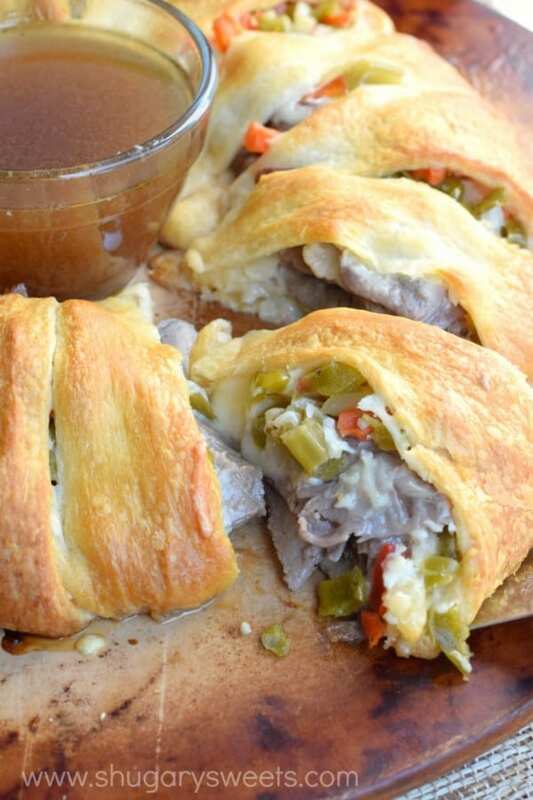 If using Papa Charlie's Italian Beef, heat up the remaining au jus in the container, in a sauce pan until simmering. Serve hot Italian Beef Ring with au jus. ENJOY! 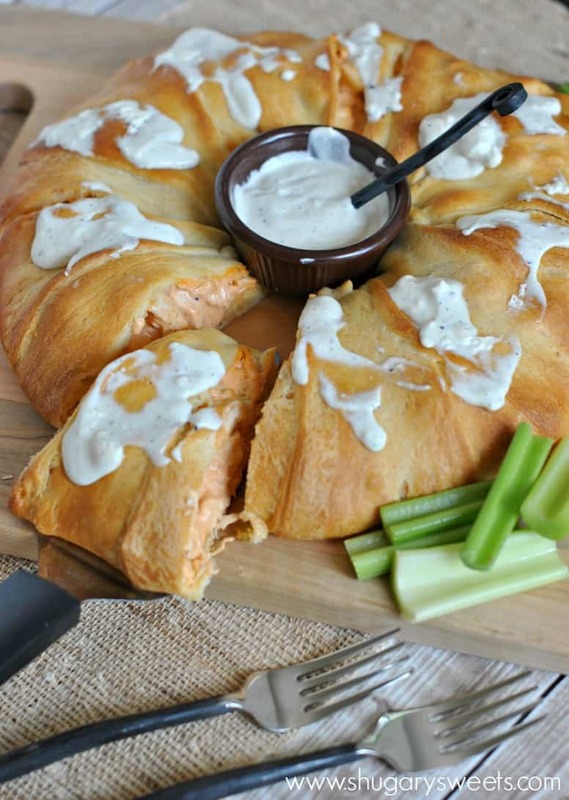 Buffalo Chicken Ring. Dinner or appetizer? You decide! 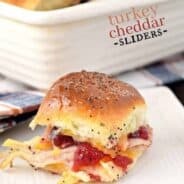 Bacon Cheeseburger Braid: this easy to assemble dinner is a hit with everyone! 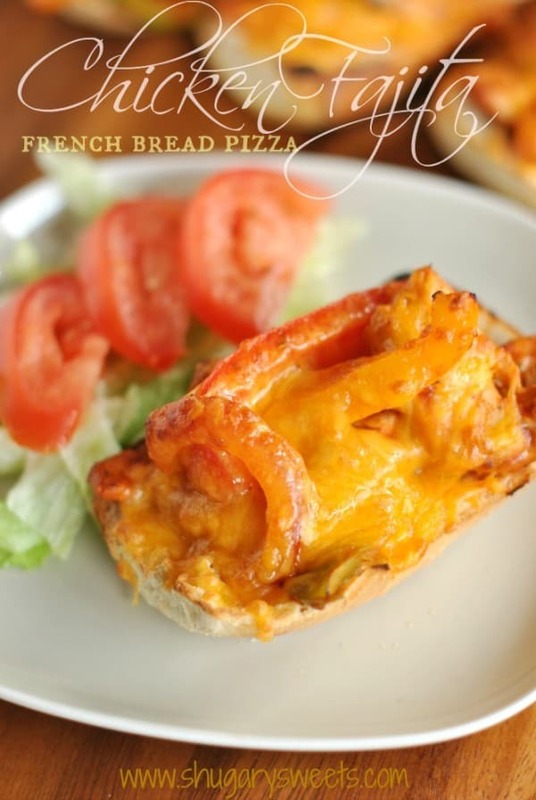 Chicken Fajita French Bread Pizza: easy to eat, easy to make! I confess I have not made one of these rings before but I do not know what I am waiting for! My family would go crazy over this! Can’t wait for Chicago! I wanna put a ring on it! On my dinner table, I mean. This looks absolutely mouthwatering! How hearty and yummy! It looks pretty too!